The House of Representatives passed two bills Thursday focused on illegal immigration. 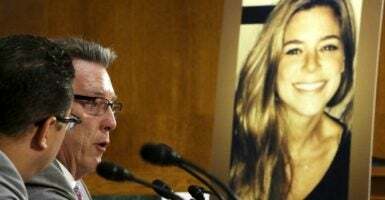 One bill, Kate’s Law “enhances the current maximum sentences for illegal reentry into the United States, serving as a strong deterrent for deported felons seeking to come back to the United States,” according to its sponsor, Rep. Bob Goodlatte, R-Va. It passed 257-167. The other bill, the No Sanctuary for Criminals Act, deems sanctuary jurisdictions, cities, and states that do not cooperate with immigration officials or enforce immigration laws, ineligible for certain types of federal funding. That passed 228-195. “Let’s pass this legislation for Kate. … Let’s pass it to stop more people from becoming victims of senseless, preventable tragedies,” said House Speaker Paul Ryan’s press office. “The death of Kate Steinle and too many others are tragic,” said Goodlatte, who chairs the House Judiciary Committee, in a statement. “Her death is particularly devastating since it could have been prevented if our immigration laws had been enforced. The person responsible for her murder was a known felon who had been deported numerous times. There is no reason he should have been free to roam our streets and take away Kate’s life. Both bills were authored by Goodlatte. San Francisco is a known sanctuary city. President Donald Trump spoke about Steinle during his presidential campaign as evidence that the U.S. needs stronger immigration policies. “This senseless and totally preventable act of violence committed by an illegal immigrant is yet another example of why we must secure our border immediately,” Trump said in 2015, according to CNN. Lopez-Sanchez’s trial is expected to take place sometime this year.